matchmycolor brings together a unique offering of IT services and colour know-how, resulting in new advanced technical software solutions. Developed for the graphic arts, paints, plastics, fibres, cosmetics and ceramic industries, matchmycolor software has been built up over more than 40 years, it is designed to ensure consistently accurate and efficient colour matching and communication no matter what the application. ID Creations were commissioned to create the brand identity for the matchmycolor Colibri® software. 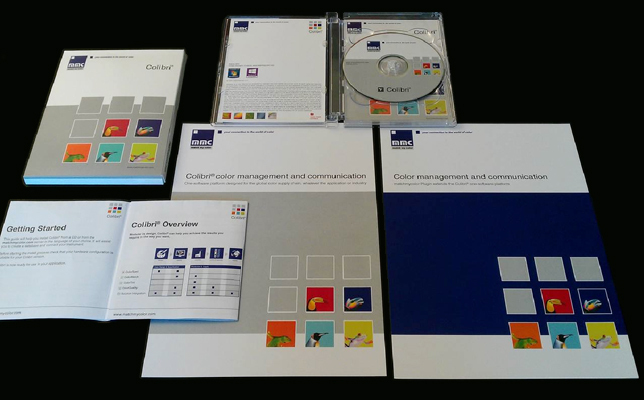 The software allows accurate management and communication of real colour along the entire colour supply chain – from design and specification, through production, to certification and supply of coloured products. The Colibri® logo represents a one platform solution for cloud, enterprise environments and single-client installations. The platform enables the user to add modules, fast access to shared data and seamless colour communication. Each module is represented within the main Colibri® logo with its own graphic element and colour. Following the design of the Colibri® brand, ID Creations has produced brand guidelines, software packaging, printed literature, exhibition graphics, signage, HTML emails and website graphics and has developed a strong working relationship with the company. “I have known Nicky for many years and have been very impressed with the quality of her work and her creativeness. She understands very quickly our requirements and is able to translate this into a final design for use in our branding or on our website”.